In 2009, Alice Morrin was shot and killed in her home by her husband who had then shot and killed himself with their two children in the house. The reasoning behind his actions, they just were not meant to be. They had talked about getting a divorce for a while, but they were trying to make it work for the kids. Sarah Netter reports, “As Alice Morrin’s husband roamed their Vernon, Conn., home, armed with a knife and gun, the mother of two was sending frantic text messages to a friend and placing a call to 911.” (Netter) Her husband had thought she was texting a man who he had thought she was having an affair with. Whether or not she was or was not having an affair, it does not give him the right to kill her. If they would have gotten a divorce in the first place, maybe they both would still be alive and both the kids would still have their parents. Going through a divorce can be a horrible situation but adding kids into the mix doesn’t make it any easier. Arkowitz and Lilienfeld state that, “Many of the 1.5 million children in the U.S. whose parents divorce every year feel as if their worlds are falling apart. 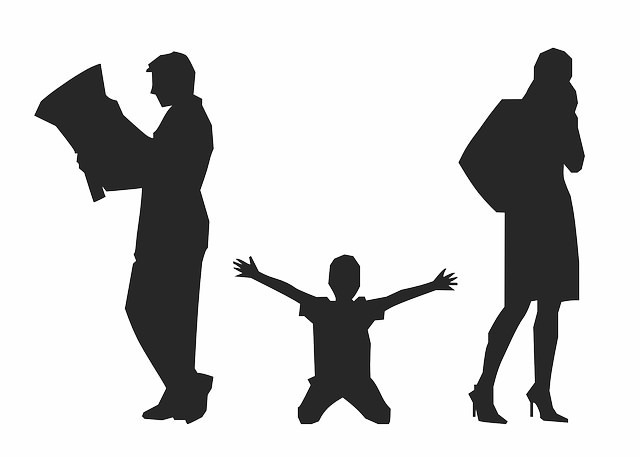 Divorcing parents are usually very concerned about the welfare of their children during this troublesome process. Some parents are so worried that they remain in unhappy marriages, believing it will protect their offspring from the trauma of divorce” (Arkowitz and Lilienfeld). However, they explain that “Parents who split have reasons for hope.” Divorce affects most children in the short run, but kids recover rapidly after the initial blow. “The good news is that although divorce is hard and often extremely painful for children, long-term harm is not inevitable. Most children bounce back and get through this difficult situation with few if any battle scars” (Arkowitz and Lilienfeld). Children hurt more when parents stay in a failing marriage instead of getting a divorce. Dr. Shoshana Bennett, a clinical psychologist, explains this in her “5 Ways Divorce Benefits Kids.” She brings up a lot of good points including when parents are happier so will the kids. No one is happy when there is tension between couples. However, once they split and move on they have the opportunity to be happier which then the children now have a happy mom and dad. Bennett also talks about the kids being more relaxed, the parents modeling a good healthy relationship, experiencing each parent as a full parent, and last but one of the most important benefits is the potential for the kids to see their parent being happy as an individual or being with a better partner. Most kids’ behavior falls back on what is going on in their life, “you can measure the level of tension in the air by their behavior” (Bennett). If this tension goes away and the environment they are living in becomes calmer, so will their behavior. Staying in a relationship for the kids will just show the kids negativity. It will teach them if they are ever in that situation then they just have to deal with it; however, if their parents divorce it will show them not to settle for an unhealthy marriage. Normally when the parents are together, one has all the responsibility of the children. However, when the parents are split they both have to focus on the children 100 percent and give them their full on attention. The bottom line is whether the parent stays single or starts a new healthy relationship, their children will see the happiness and independence their mother or father now has, which are both positive for the children. DeProspero understands why unhappy marriages linger for the supposed betterment of the children. The intention is good. However “If we are being honest,” he says “People don’t stay in bad marriages because they believe it’s what’s best for their children. They stay in bad marriages because they personally don’t want to be separated from their kids. It makes complete sense, but that doesn’t make it right.” Nobody wants to lose time with their kids, nobody wants to split their time with their ex, but if the married couple cannot get along and do not want to be together then in the long run is better for the children to just go on their own paths in life. DeProspero goes to talk about a few pointers. If you are in the same type of situation, be honest with each other. Communication is key not to just every relationship but every friendship also. If you don’t talk and let the other person know how you feel or what you are thinking then you will not get anywhere, nobody can read minds. The worst thing couples can do in a failing marriage is ignoring it. Ignoring the situation can make it last for years. DeProspero also says, “Two happy separated parents are better than two miserable together parents.” If the couple still have love between each other and both are willing to take steps towards working it out, there is certainly value in staying together, but if one person has already lost their love for the other or is just done with the marriage overall then they are only ruining their children’s memories with anxiety and hate. “Researchers have learned that the area of the brain thought to play a key role in encoding long term memory matures in spurts. The brain’s major spurt is after a person’s first year of life and then takes another year to fully mature” (Onion). That means toddlers as old as two could start remembering memories. If a couple is constantly fighting in front of their children, they could possibly remember it and as they get older looking back on their first memories all they will remember is their parents fighting all the time and not being happy. “At age 10, I was already reflecting on the fact that some of my earliest, definitive memories were of my parents fighting” (White). Zaren White’s parents split up 18 years ago and when they did she was not the least bit surprised. She talks about this in her “Parents: Don’t stay together for the kids. You’re not doing them any favors.” She explains how going from a two-parent household to a single-parent household was a bit confusing in a lot of ways. She and her mother would have to move out of their house with a beautiful backyard and view of the bay, into an apartment or even her grandmother’s basement and she would have to change schools again. Although she was scared and did not want her life to change, she accepted and welcomed the separation and the divorce. Her parents’ divorce had taught her a lot of useful lessons, not settling down with your first partner and not rushing to get married at a young age. “I have a deeper appreciation of my parents as people.” White talks about how her mother had a full-time job and an at home “second shift” of cleaning, cooking, and childcare of her and her 4 year old brother that is autistic. However when White was 12 her mother started dating again and she began to see and value her mother more than just a mom but as a person. Many people including White and DeProspero go through their parents divorcing either when they were younger or as they grew into adults. Just because their parents divorced doesn’t mean it was the end of the world. It was better for them and they turned out just fine. I have never been divorced nor had my parents go through one. I have my own little family. My boyfriend and I have our ups and downs but we decide to work through our problems. When you’re with someone for so long, you always have a deep love and appreciation for them but sometimes it gets covered up with stress, taking care of the kids, work overload etc. However in my opinion, I think instead of just giving up you should work on uncovering all of that and finding the love you have had for them all over again. But if the father of my son and I were fighting every second of every day, then I would have no choice but to split because I could not subject my son to that kind of environment. Many people would argue the fact that breaking up a family is not right and that the children need both mommy and daddy, but the truth of the matter is that some people are just not meant to be. Just like Alice Morrin and her husband were not meant to be but they tried staying together for their children and now they are both dead and the children do not have their mother or father. If you are in fact in a failing marriage but you are thinking about sticking together for the children, take some time to think about it. I would rather have a split mother and father than none at all. Arkowitz, Hal, and Scott Lilienfeld, “Is Divorce Bad for Children?” Scientific American. Scientific American, 13 February 2013. Web. 31 March 2015. Netter, Sarah. “Conn. Wife Pleaded for Life, Daughters’ Safety Over Text Message.” ABC News. ABC News, 2 July 2009. Web. 26 March 2015. Onion, Amanda. “When Do Babies Develop Memories?” ABC News. ABC News, 30 October 2014. Web. 9 April 2015. Submitted for ENG 101 Composition, Spring 2015. Assignment: Research Argument. Graphic credit: “Divorce” by Tony Guyton, licensed through Creative Commons. The work was really great. The way that the writer told a short story about this Joe person and how he expected his parent’s divorce but not until he was twenty years old. He saw them live a life together unhappy with each other, though he was sad a bit about it he also knew that it would be coming up soon. People in the world go through all this and the writer grasped that. Really well done indeed.